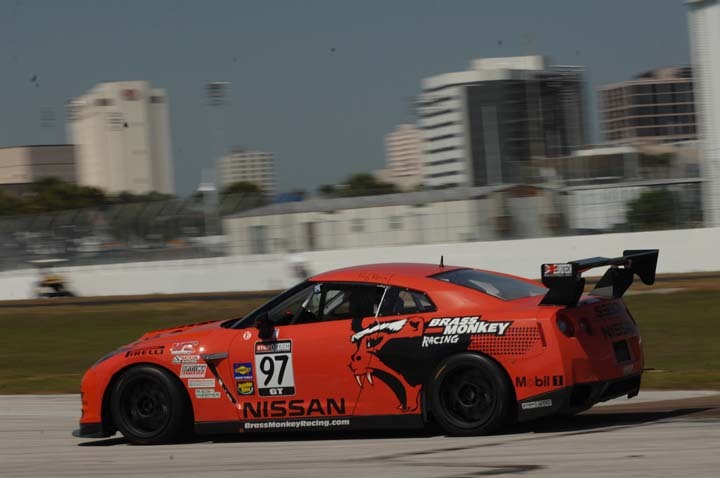 Steve Ott, in the #98 Brass Monkey Nissan GT-R finished in 6th place in the season opening race number one at St. Petersburg, Florida. Tony Rivera in the #97 GT-R had contact with the wall just two laps in, and was unable to complete the race. Patrick Long in the Truspeed Motorsports 911 won the caution shortened first race on Saturday. 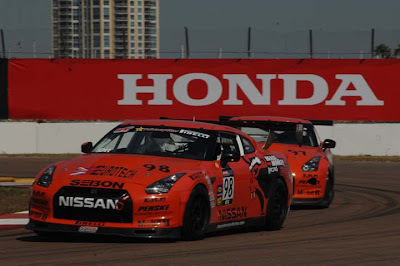 Longs quick time was a 1:16.2, the quick GT-R time was a 1:18.3, so they need to pick up the pace for the second race of the weekend, scheduled for Sunday at 4:30PM. The second race is viewable via livestream at http://www.world-challengetv.com. nice cars but, his cars are to high that means suspencion work. and they probably need to work on the engine to handle more boost like the volvos. your cars are way too high. and probably need to work on the engine itself for more turbo boos, like the volvos.